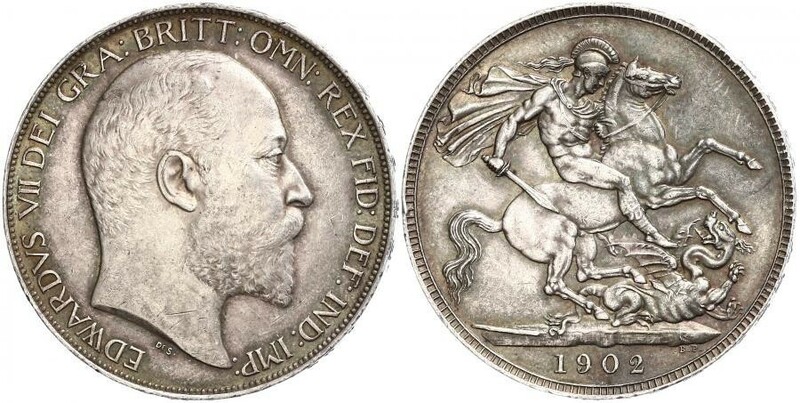 1902, Great Britain, Edward VII. Beautiful Silver Crown Coin. 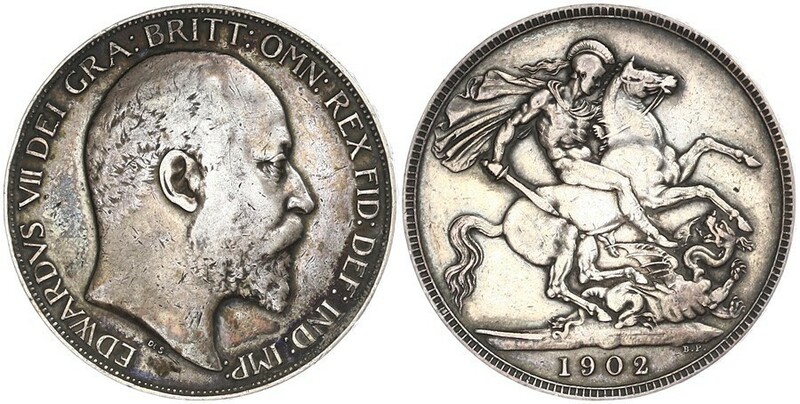 Obverse: Head of Edward VII right. Engraver&acute;s initials (D.S.) below. Comment: Broken shaft of lance to left on ground, engraver&acute;s initials (B.P.) below ground to right. Date (1893) below. Benedetto Pistrucci (May 29, 1783 – September 16, 1855) was a talented engraver of gemstones, cameos, coins and medals. 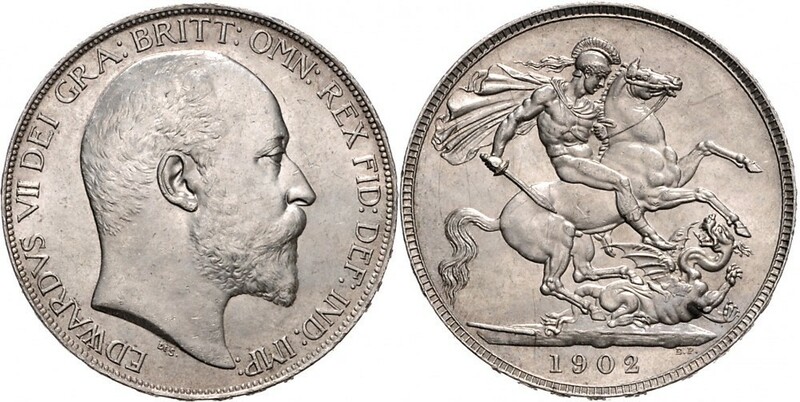 Born in Italy, he moved to London in 1815 and was employed at the Royal Mint as an engraver, where his most famous work is his portrayal of St. George &amp; the Dragon used on British gold sovereigns and crowns first created during the Great Recoinage of 1816. 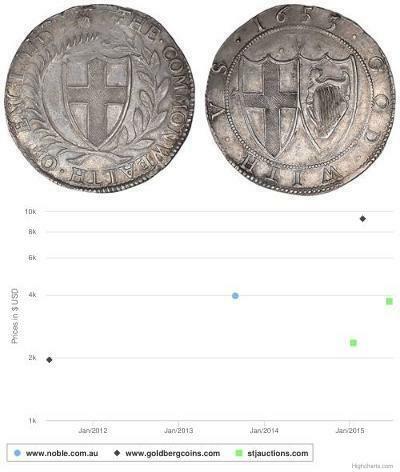 He also engraved the dies for many other coins, medals, and medallions, including the Waterloo Medal, which took him over thirty years to complete. He refused to copy the work of any other artist or engraver, and insisted that all his work was his own original work. Because of his Italian origin, he was not officially recognised as the chief engraver at the Royal Mint, and there were rivalries with other engravers including the Wyon family. 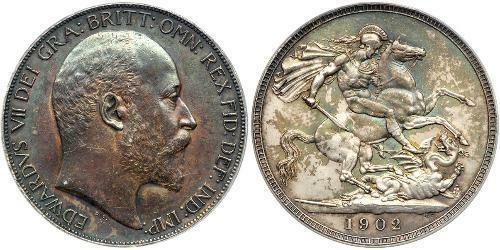 Edward VII (Albert Edward; 9 November 1841 – 6 May 1910) was King of the United Kingdom and the British Dominions and Emperor of India from 22 January 1901 until his death on 6 May 1910. 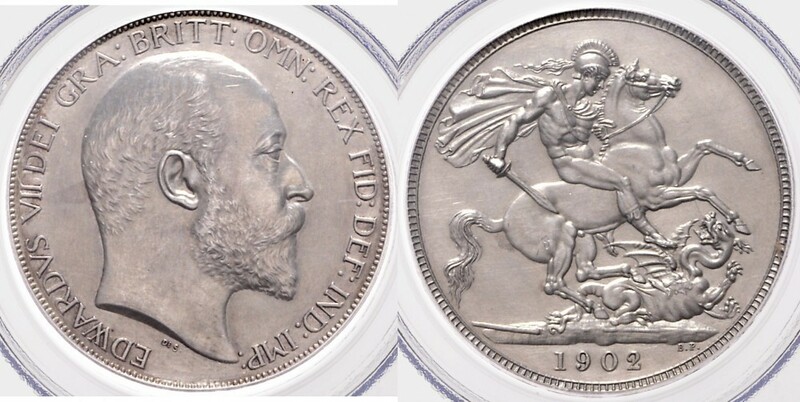 He was the first British monarch of the House of Saxe-Coburg-Gotha, which was renamed the House of Windsor by his son, George V.
The Edwardian period, which covered Edward’s reign and was named after him, coincided with the start of a new century and heralded significant changes in technology and society, including powered flight and the rise of socialism and the Labour movement. Edward played a role in the modernisation of the British Home Fleet, the reform of the Army Medical Services, and the reorganisation of the British army after the Second Boer War. His work in fostering good relations between Great Britain and other European countries, especially France, for which he was popularly called &quot;Peacemaker&quot;, was unable to prevent the outbreak of World War I in 1914.